When we take time away, even part of a day, and allow the questions and concerns on our hearts to surface in God’s presence, he will speak to us. We find there is time for reflection and the dialogue with him that transforms our lives. Retreats are centered around specific healing topics such as our image of God, messages that shape our identity, damage from mother or father wounds, and self-acceptance. The Lord meets each person through the varied activities of the day, which includes individual prayer ministry. 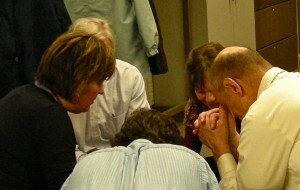 To expand the reach of our healing retreats and clinic ministry, we are transitioning toward more off-site ministry. On a small scale, we are preparing to minister at other churches or groups, combining teaching and ministry according to the need. We draw on teachings from several ministry sources including the practice of prayer that is foundational to All Things New. We are currently revising our teaching materials and plan to offer training soon.